The renin-angiotensin-aldosterone system (RAAS) represents one of the most important contributors to vascular, cardiac, and renal pathology. Its major effector peptides, notably the octapeptide angiotensin II (AngII), induce vasoconstriction (directly and indirectly via sympathetic activation and vasopressin release) and participate in processes of vascular and cardiac hypertrophy, remodeling, inflammation, and fibrosis, directly through action on the angiotensin AT1 receptor and indirectly through aldosterone stimulation. In addition, the RAAS engenders renal salt retention and is involved in various renal pathologies. By the above mechanisms, the RAAS contributes to the development and maintenance of arterial hypertension. RAAS-induced vascular, cardiac, and renal pathologies occur already in the prehypertensive state, i.e., before overt hypertension has developed. Recently, a so-called protective arm of the renin-angiotensin system (RAS) has been described including angiotensin-converting enzyme 2 (ACE2), the angiotensin AT2 receptor, and the Ang 1–7/Mas receptor system. The “protective RAS” appears to represent an intrinsic opponent of the classical “harmful RAS,” and stimulation of this system may become an important therapeutic approach in individuals at cardiovascular risk. Inhibitors of the “harmful” RAAS (ACE inhibitors, AT1 receptor, and aldosterone receptor antagonists) have been successfully introduced into the clinic with a broad spectrum of indications, particularly as antihypertensive agents. 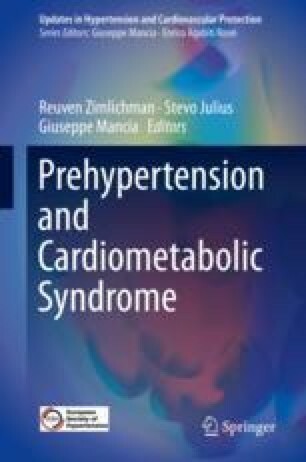 The TROPHY study with the AT1 receptor blocker, candesartan, and in the PHARAO study with the ACE inhibitor, ramipril, have provided evidence that the natural course from prehypertension to hypertension can be delayed, supporting the idea that in certain patient populations at risk, chronic antihypertensive treatment with an inhibitor of the RAS started already in the prehypertensive phase may exert protection by preventing the onset of high blood pressure disease.